This fantastic range of wardrobe bedroom doors are made to the highest standard and a beautiful addition to any bedroom design. Our Bella Vinyl wardrobe door range are all vinyl wrapped with matching backs including laminate wardrobe panels and a mirrored finish. One continuous piece of vinyl covers the face and edges giving a high-quality durable design. 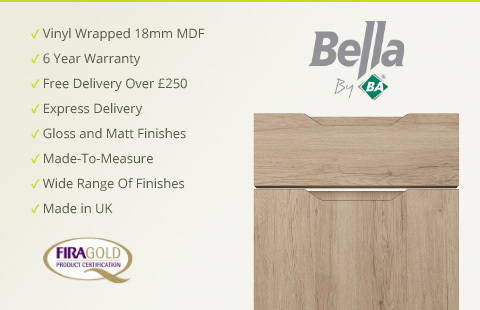 Bella doors pass the FIRA Gold award test for excellence in furniture and now come with a 6‑year guarantee. You can choose virtually any design with any finish. We have over 20 door styles and 35 colour finish options in this range, so we're sure you'll be able to find a bedroom unit door combination that will suit you in every way. Shop our range of bespoke wardrobe doors today. For curved doors please see the Bella bedroom accessories section. Our range of stunning Bella bedroom doors enjoy a strong reputation for being manufactured to the highest standards of quality. The fantastic range includes a series of wardrobe doors, accessories, and made to measure vinyl bedroom doors among other solutions. With more than 23 styles and 35 vinyl colours available, this exciting range of high gloss doors will be sure to have a style suited for you whether you prefer a contemporary or traditional approach. With an impressive collection of doors, accessories, styles, and colours coming together to form more than 700 combinations, the bedroom collection is designed to suit you in every way. From bedroom doors to hinged wardrobe doors, we have all of the products necessary for the installation of a brand new fitted bedroom or a modern face lift to an existing fitted bedroom. Our doors are manufactured with the highest standard medium-density fibreboard, demonstrating the company’s commitment to the environment using materials sourced in sustainable forests. The high quality durable finish is created by a continuous piece of vinyl that covers the edges and face of the door. No matter what design or which finish you choose, they all come with a six year guarantee. Our range enables homeowners to completely customise their entire fitted bedroom starting with our selection of doors for your bedroom and matching wardrobe doors. We also have a complete range of matching vinyl accessories, vanity units, bedside cabinets, headboards, worktops, and drawer fronts to create a completely coordinated bedroom. For lofts and awkward spaces, we also have angled doors that can be tailored to each space. All of our doors and matching vinyl accessories can be made to measure for the exact size that you require. Replacing or choosing the door to your bedroom is never a decision to take lightly. As one of your primary living spaces, your bedroom is a highly personal area that reflects your individual personality and should be carefully designed to promote relaxation and comfortable living. Your decision to transform your bedroom will not only impact the resale value of your home but will also impact your life for years to come. The best way to create the perfect bedroom solution for you is to be informed and clearly understand the extensive options available. For nearly twenty years, Bella bedroom doors and accessories have been produced with expertise to the highest standards of quality with consideration for the environment and the satisfaction of clients in mind. Wardrobe Doors: Our range of made-to-measure vinyl wardrobe doors reflects the highest standards of quality but at prices that make bedroom transformation affordable. Whether you need replacement wardrobe doors or vinyl wardrobe doors for a new fitted bedroom, our collection offers a range of standard sizes and made-to-measure options. Cupboard Doors: Our extensive range of cupboard doors allows homeowners to customise their bedrooms by selecting from the broad ranges of designs, colours, and sizes available. These doors can be used in other parts of the home such as bathrooms, kitchens, offices, and living areas. Drawer Fronts: Our top quality matching drawer fronts come in the same number of designs and colour options as other popular ranges. These affordable drawer fronts can be purchased in standard sizes or made-to-measure. Framed, Sloping, and Feature Doors: Choose from our wide range of 23 designs and more than 30 colour options when choosing one of our specially designed doors. These doors are available to match wardrobes, cupboards, and drawer fronts. We can customise sloping doors for any type of roof slant whether you need just a door or an entire row of cupboards. Vinyl Accessories: Take your bedroom to an entirely new level by finishing it off with our elegant and modern range of vinyl wrapped accessories. You can create a completely coordinated bedroom by complementing your bedroom doors, drawer fronts, and wardrobe doors with matching end panels, plinths, cornices, and pelmets. Our extensive colour range is designed to suit a range of styles whether you are seeking a traditional, classic, or modern bedroom design. Our bedroom products are available in 37 colours including 9 high gloss colours, 16 wood grain patterns, and 12 solid colours. Colours are available in the majority of door styles and can be complemented with the matching accessories. Select from a wide range of options including Ivory, Light Walnut, Matt Olive, Matt Stone Grey, Alabaster, Canadian Maple, Dark Walnut, Natural Oak, and Moldau Acacia to name a few. Our collection also offers a paintable vinyl option that can be customised to your own colour preference. Our 24 different styles are available for not only bedroom doors but kitchen and bathroom doors as well. All styles are available in standard and made-to-measure sizes. With a range of options to suit a variety of tastes, homeowners can choose from one of our contemporary, gloss, or traditional classic designs. These modern designs reflect simplicity with their elegant and sleek lines. Each new or replacement bedroom door may be complemented by the wide array of accessories available that have been carefully tailored to suit your home and lifestyle. From made-to-measure drawer fronts and wardrobe doors, you can choose the style that reflects you best including Gothic, Broadway, Cambridge, Tuscany, Roma, Milano, Licoln, Newport, and Oxford among many other choices. Your bedroom is a reflection of your personality. It’s easy to give an old and tired bedroom a new lease on life by infusing it with fresh colours and giving it a style boost. Modernising a bedroom doesn’t need to be expensive and with our bedroom range, you can breathe new life into your bedroom without the heavy expense of a full refit simply by replacing bedroom and wardrobe doors. With unique finishing touches including bedroom storage, handles, and other accessories, the Bella collection is custom tailored to offer something for everyone regardless of style and preference. With beautiful craftsmanship, environmental sensitivity, and attention to detail, you won’t have any problem designing a bedroom where dreams are made.